I wrote this article because it was long since I searched a low cost and simple to use media center. I finally find THE (for me 🙂 ) solution to have a simple and very low cost media center at home. This installation guide can be followed by everyone and it doesn’t require special knowledges of Linux or something else. To build your own media center, you must have a computer. If you have one that you can use for this, you are lucky, and if you don’t have one (in my case for example) you must buy one. As I wanted a low cost system, the computer will be a RaspberryPi (B model). A RaspberriPi is one of the cheaper computer in the world. In my case, I buy one for 35 $. You can order it at the following link : Order RaspberriPi from Farnell . It’s important to have a model B because it has 512 MB of RAM instead of 256 for the model A and a 10/100 Mb/s Ethernet port. I suggest you to order a SD card of 8 GB to use it with your RaspberryPi. 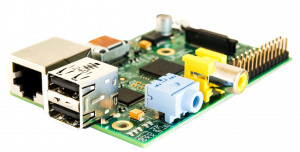 The next picture shows you the corresponding RaspberrryPi. Note : Some cases exist to protect you raspberryPi. I suggest you to buy one. The second step is the media software itself. There are many free and opensource softwares but after tested some of them, I suggest to use OpenELEC. Why this one ? The next step is to install the OpenELEC distribution on the RaspberryPi. A detailled procedure is available here but the minimal steps are in this article. Note : Be sure that sdX correspond to your SDcard ! All datas on the sdX will be erased. That all 🙂 Can you make easiest ??? Now, safely remove your SD card and place it in your Raspberry Pi. Connect it to your display, plug in the ethernet cable and power it on. At this point, you have a fresh install of OpenELEC Linux distribution on a RaspberryPI. Now I let you play with your new media center. It’s very simple. 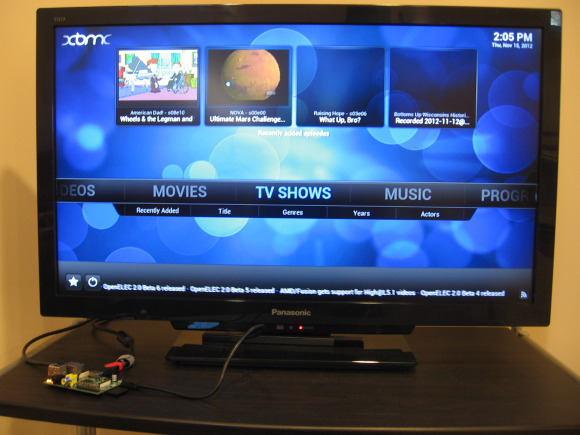 Tagged linux, mediacenter, raspberryPi, xbmc.